Who says black cats are bad luck? A purr-fectly fine creepy prop for your haunted house or home haunt. If guests are curious about this cat they’ll be in for a terrifying surprise! This animated unlucky black cat witch familiar makes a spooky home decoration for any Halloween costume party. Any noise will make this sound activated feline come to life with terrifying sounds and head movement. 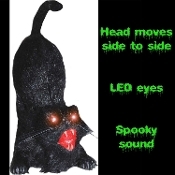 Head moves side to side, eyes light up and scary cat and storm sounds play. Features artificial fur over dense polystyrene foam and plastic armature. Requires 3-AA batteries, not included. Approx 21.5-inch (53.75cm) Tall x 14-inch (35cm) Long x 3-inch (7.5cm) Wide.